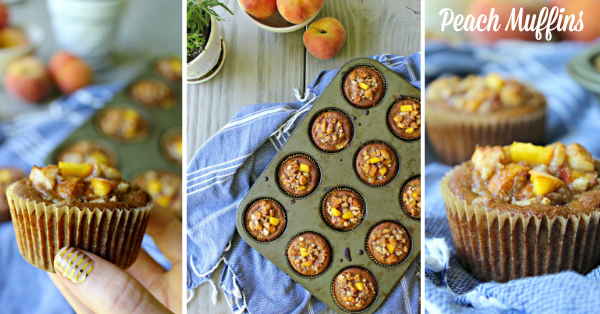 If you are looking for a delicious, healthy, grain-free Peach Muffins recipe, then look no further! This simple recipe uses fresh peaches & is Paleo approved. 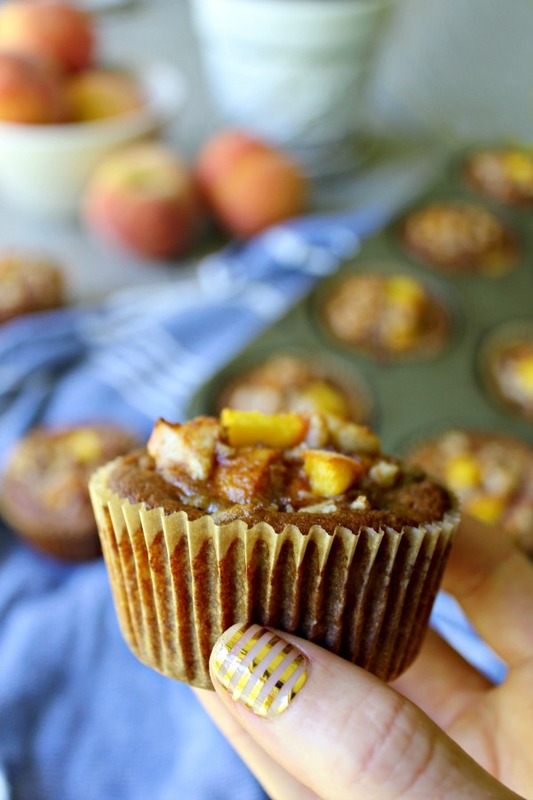 Mmmm….Peach Muffins! How delicious do these look?! My husband came home with a basket full of fresh peaches that needed to be used quickly so I knew I had to get creative. 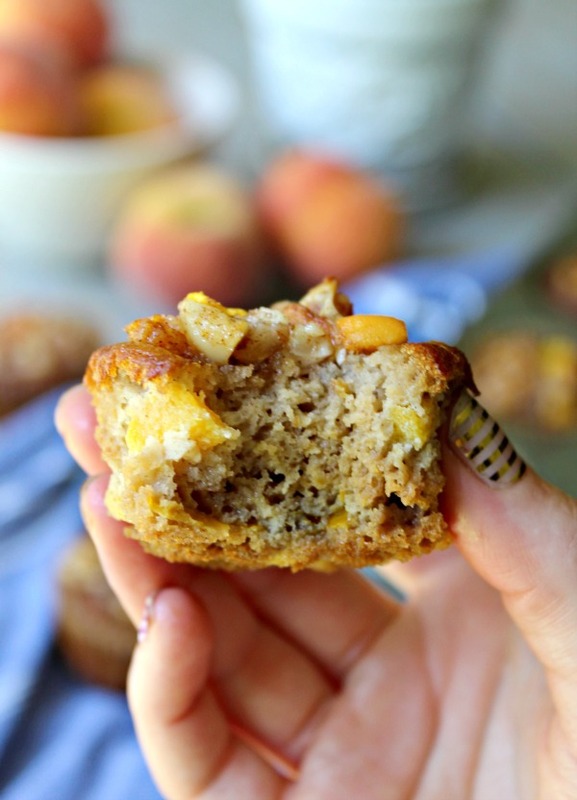 I made Peach Salsa, Peach Hot Sauce, Peach Crisp and then I whipped up these easy grain-free, Peach Muffins. They were so good and a hit with everyone so I knew I had to share the recipe with you. They’d make a fun breakfast treat or a wholesome, healthy snack. They are made with real, simple ingredients and are dairy-free, grain-free and paleo approved…and absolutely delicious, too! Enjoy the recipe! In a medium mixing bowl, mix together the eggs, coconut oil, milk of choice, honey and vanilla extract until well blended. Add in the coconut flour, baking soda, cinnamon and sea salt and mix until smooth. Fold in 1 cup of diced peaches. Fill 12 regular size muffin liners ¾ full with your peach batter and bake for 15 minutes. While baking, let's make the simple cinnamon nut topping: Mix together ½ heaping cup diced peaches, chopped nuts, honey and cinnamon. Set aside. Once the 15 minute timer goes off, take the muffins out of the oven (they won't be fully cooked yet!) and add a heaping teaspoon or two of topping over teach muffin. Put back in the oven and bake for 15-20 minutes longer until muffins are golden brown and cooked throughout. Let sit for at least 15 minutes before serving. The muffins will firm up as they cool. I like to wait at least 15 minutes before serving them. These sound wonderful Kelly! I rarely make anything with fresh peaches since they are so delicious on their own. But this recipe is easy and uses ingredients i have on hand. Can’t wait to try them as soon as I pick up some fresh peaches! I used regular butter (not paleo I know), vanilla unsweetened cashew milk, agave nectar, and coconut extra in replacements for the recipe and it tasted amazing! I also baked it into a cake rather than muffins and just let it cook for 10 minutes longer, checking up on it every few minutes and it was a hit! Would it work to use WELL DRAINED canned peaches? I hope you love them, Elizabeth! I made these today and they are INCREDIBLE!! I have a ton of fresh Niagara peaches from the farm and plan to make another batch tomorrow night 🙂 I used less than 1/4 c honey and found that to be perfect for sweetness. thanks for the great paleo recipe! Thanks for your kind words, Mary! Looks delicious, it’s not peach season yet, but I’m ready to try them! 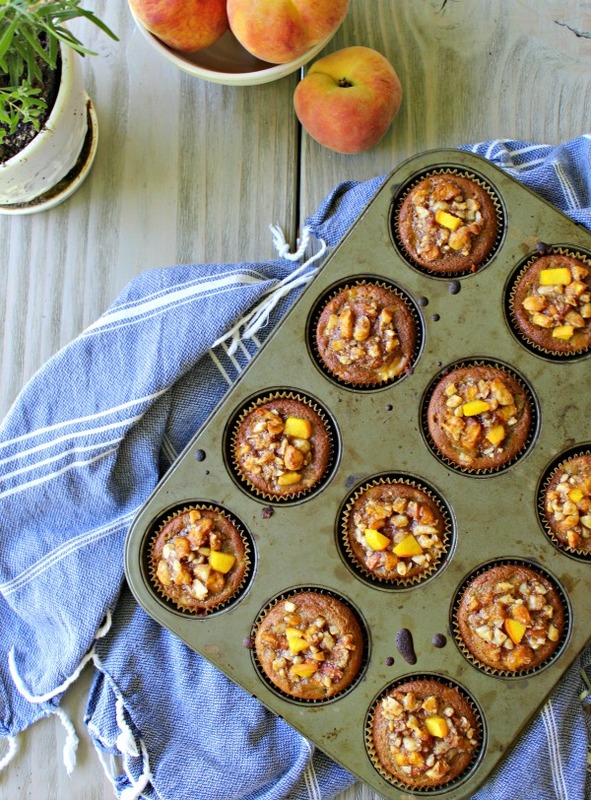 Delicious looking Peach Muffins. Thanks a lot for it’s introduction to the masses. I have jotted down all the recipe.Hopefully try sometime…Thanks once again kelly. I like peach and I like muffins when they come together like this I love them more! Tonight I’m cooking this for my boyfriend. Hello, they look adorable. peach muffins recipe to enjoy. Thank you for sharing. Made these yesterday and were super Delish! They did come out super soggy but hey that added to the scrumptiousness (and perhaps i put in too many peaches). Question, now that I’m out of peaches, do you think this recipe would work for apples? These looks super yummy and i am already looking forward to making them this weekend. Thanks for posting this. I thought I couldn’t love muffins more than I already did, but then I saw this.